There are instances where pulsations on the suction side of a reciprocating pump can cause the same problems with vibration and hammer seen on the discharge side. During the suction stroke of the pump, each piston stroke must overcome the inertia of the columns of fluid in the suction pipe work. At the end of each stroke, this inertia must again be overcome to bring the fluid columns to rest. This cycle of alternate acceleration and deceleration causes the same pressure spikes as experienced on the discharge side of the pump head. These pressure pulsations may cause system vibration and pipe shake. Even more devastating damage may occur in the suction piping as a result of fluid cavitation. One common cause of fluid cavitation that can be easily remedied is acceleration head losses in the suction piping causing the Net Positive Suction Head (NPSH) available to fall below the value required for the pump. NPSH is the difference between the total pressure on the inlet side of the pump less the vapor pressure of the liquid and the friction losses of the suction pipe work. If there is insufficient NPSH, the suction stroke of the pump may cause the fluid pressure to fall below the vapor pressure of the process fluid, causing local boiling of the fluid and producing vapor bubbles which come out of the solution. Once the pressure increases again, the bubbles collapse producing pressure waves of high intensity. These pressure waves are extremely damaging to the pump and piping. 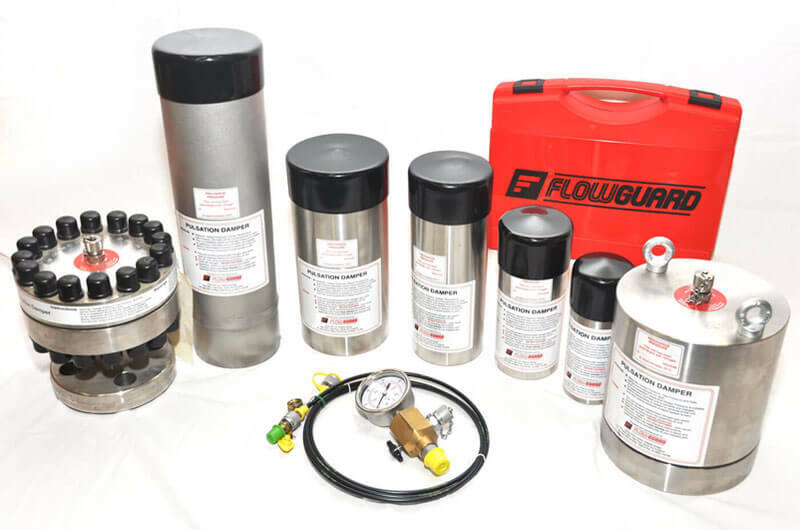 Flowguard Suction Stabilizers can be sized to recover up to 95% of acceleration head losses and can easily make the difference where NPSH is concerned. Regardless, it is a parameter which every specifying engineer is obliged to check when applying a reciprocating PD pump.